Sauna is the Finnish word for "bath" and has been a way of life in Finland for over 2,000 years. Saunas work by adding water to superheated rocks to create humidity and encourage perspiration. Perspiration is a natural way to cleanse the body of impurities, clean the skin, open the pores, and keep the skin pliant. Saunas are a surprisingly affordable luxury. Whether you are in the market for a traditional sauna or a modern infrared room, the knowledgeable staff at New Wave Spas will help you find a solution to fit your needs and budget. We also carry heaters and other accessories, and can assist you with installation and maintainence as well. 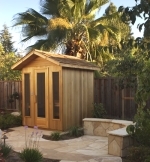 Saunas can be installed almost anywhere! Thank you so much for the replacement tub lid! We feel you have always gone above and beyond our expectations. We have a Softub distributer less than an hour from here, but we love you guys! Thanks again.